Published in cooperation with the Association for Research on Nervous and Mental Disorders. 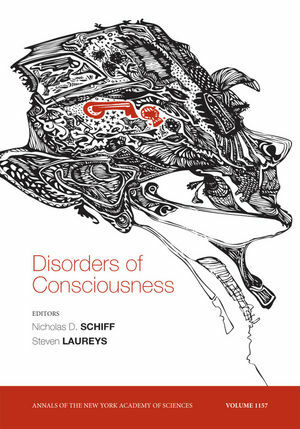 Nicholas D. Schiff and Steven Laureys are the authors of Disorders of Consciousness, Volume 1157, published by Wiley. Preface: Nicholas D. Schiff and Steven Laureys. 1. Dualism persists in the science of mind: Athena Demertzi, Charlene Liew, Didier Ledoux, Marie-Aurélie Bruno, Steven Laureys, and Adam Zeman. 2. Synchrony in the Interconnected Circuitry of Thalamus and Cerebral Cortex: Edward G. Jones. 3. Definition of Arousal and Mechanistic Studies in Intact and Brain-Damaged Mice: Isabel Arrieta-Cruz and Donald W. Pfaff. 4. Coma: G. Bryan Young. 5. Theories of Impaired Consciousness in Epilepsy: Lissa Yu and Hal Blumenfeld. 6. Simultaneous Electroencephalography and Functional Magnetic Resonance Imaging of General Anesthesia: Patrick L. Purdon, Eric T. Pierce, Giorgio Bonmassar, John Walsh, P. Grace Harrell, Jean Kwo, Daniel Deschler, Margaret Barlow, Rebecca C. Merhar, Camilo Lamus, Catherine M. Mullaly, Mary Sullivan, Sharon Maginnis, Debra Skoniecki, Helen-Anne Higgins, and Emery N. Brown. 7. Exploring altered consciousness states by MRI in brain injury: Thomas Lescot, Damien Galanaud, and Louis Puybasset. 8. Neuroimaging and the Vegetative State: Resolving the behavioral assessment dilemma: Martin M. Monti, Martin R. Coleman, and Adrian M. Owen. 9. A brain-computer interface controlled auditory even-related potential (P300) spelling system for locked-in patients: Andrea Kübler, Adrian Furdea, Sebastian Halder, Eva Maria Hammer, Femke Nijboer, and Boris Kotchoubey. 10. Central thalamic deep brain stimulation in the severely injured brain: rationale and proposed mechanisms of action: Nicholas D. Schiff. 11. Ethical Issues in the Treatment of Severe Brain Injury: The Impact of New Technologies: James L. Bernat. 12. Being Conscious of their Burden: Severe Brain Injury and The Two Cultures Challenge: Joseph J. Fins.